What do the numbers 27, 81, 243 and 2187 have in common? They are all factors of 3, and are the number of layers in laminated dough pastries. According to Mr Google, the croissant is a relatively modern French take on an Austrian yeasted roll, the kipferl. The kipferl is made of yeast dough, without the laminated layers. Somewhere along the way, a Viennese person introduced the kipferl to Paris, and the Parisien pastry chefs turned it into the many-layered buttery fantasy we know today. Quel genius! I have been bookmarking croissant recipes for a few months, but never had the time courage to take the plunge. When someone in the TWD group suggested croissants as our next project, I seconded that vote. Panicked. And re-read all the croissant tutorial I had bookmarked. After reading (and re-reading) the tutorials, I finally gave it a go…..on one of the hottest and most humid days we have had all summer. It was very nearly a disaster. The moment I took the dough out of the fridge, it warmed up and became floppy – gloopy even – in the wet blanket-like heat of our kitchen. The butter liquefied. But, miraculously, the croissants came together and looked kinda like real croissants. The texture and taste, on the other hand, weren’t quite croissant-like. I felt there were higher levels of croissant-greatness that I could aspire to. I tried again this weekend. The results were better. Not perfect, but better. The croissants browned well in the oven, and maintained the crescent shape. The pastry crust was crisp, and shatters when we bite into it. The insides were pillowy soft when fresh from the oven, and had the layered effect. It wasn’t the kind of honeycomb that other home bakers have achieved, but you could see the hint of honeycomb. I added little bits of marzipan and chocolate in the centre of each croissant. And that’s how we had marzipan-choc pastries for dessert on Sunday evening, and for breakfast on Monday morning. Mmm dessert for breakfast. 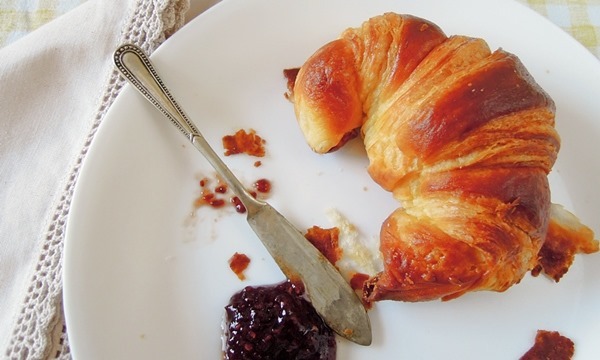 The basic idea behind croissant dough is to enclose a slab of butter in a piece of yeast dough, roll this out, and fold it repeatedly while keeping the dough and butter cool. After a few folds, the dough will consist of very thin alternating layers of dough and butter. This dough is rolled into a croissant shape or other shapes. When they are baked, (I think) the water in the butter becomes steam and separates the layers of dough, creating a puff pastry or ideally a honeycomb effect. A croissant is that tasty, yet slightly scary, juncture of science and art. The rest of the post highlights some things I have learned about making croissants, and questions that will need further investigation. Links to the recipe and three croissant tutorials are at the end of the post. Flour is important. Some recipes only ask for bread flour, others (like Sarabeth’s recipe) use a blend of cake and bread flour. I compromised and used pasta flour instead. I think the idea is to get a dough that rolls easily, but has enough gluten strength to form those layers (or ideally a beautiful honeycomb). Aim for a slightly wetter dough to start with, but not too wet. The dough should be slightly harder out of the fridge, and all that rolling and folding will develop gluten. You don’t want the dough too soft. Give the dough a chance to relax and develop gluten. A stronger dough will hold its puffed dome shape when baking. If butter is seeping through the dough or smearing on the counter, it is too soft – refrigerate some more. If it is too cold, it will be brittle. You want the butter to roll with the dough, not shatter and break the dough. Use the right type of butter, or add flour. A number of recipes ask for cultured European style butter, like Lurpak, which has a higher butterfat ratio. The butter that we find in Australian supermarkets have a higher water ratio, and can ‘weep’ moisture when the dough is kept in the fridge for more than 30 minutes. The solution is mixing a bit of flour into the butter to absorb some of the extra moisture. I was lucky enough to find organic butter which had a higher ratio of butterfat. But I added flour to the butter anyway, just to be safe. Fold the dough in a different direction each time by keeping the open seam facing towards you. I think this ensures gluten develops evenly. Ensure the butter slab is at the same temperature as the dough when you wrap the butter slab in the dough. Keeping everything cold ensures the butter and dough layers do not melt into each other. Cut the dough into triangles, and stretch the triangle by hand so they are Eiffel Tower-shaped (this was a great tip from the TWD group). Some recipes (like Joe Pastry’s) suggest making a small cut at the base of the triangle. This gives you a wider base when you are rolling the triangle, and makes it easier to create a crescent shape. Proof for a sufficient time. The croissants should be very puffy. 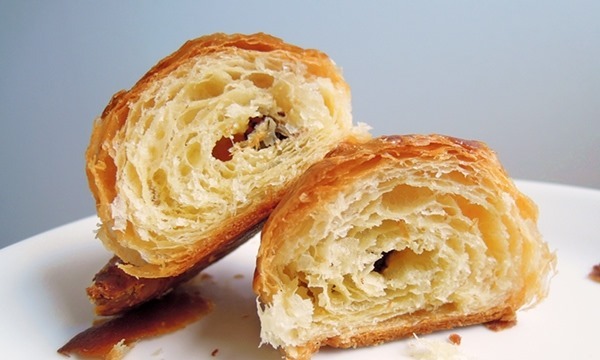 If the edge of the croissant dough is puffy, it will help to stop the butter leaking onto the pan. At this point, handle proofed croissants carefully, with a velvet glove rather than an iron fist. Speed? Others do it by proofing the dough slowly in the fridge. Others ask you to freeze the dough for at least 24 hours and defrost it. Milk? 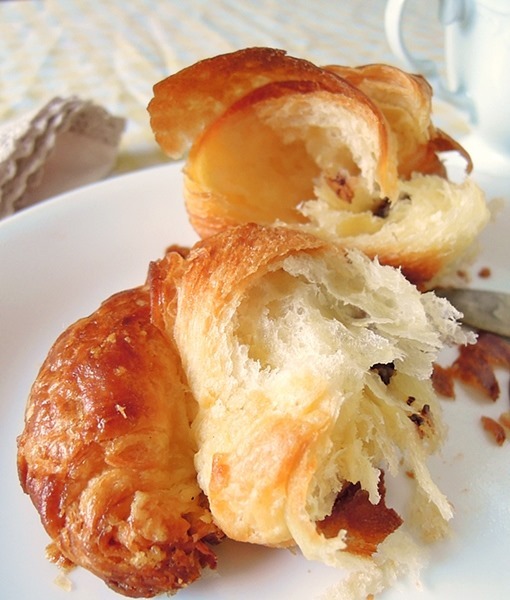 Croissant recipes use milk, or half and half, or milk and water in the dough. I’ve read that milk or half and half masked the dough softer, and water makes a crispier pastry crust. Butter slab? Some tutorials say to break up the butter and bash it into shape. Others say to keep the butter in one piece and bash it into shape. Baking with Julia’s recipe, on the other hand, says to beat the butter and flour together in a mixer. I bashed a whole piece of butter until the flour was more or less mixed. This seemed to be easier and did not require washing up the mixer afterwards. This is not a 10 minute cookie, but patience brings its own reward, in this case golden, buttery Viennese pastries that will impress all of your friends, neighbours and colleagues. I’m already wondering if I will have time to make croissants for a work function this week – or if I shouldn’t push my luck too far, and should stay with something safe, like a jam tart. The recipe is available at Food + Girl = Love. To see what other TWD bakers have done, go here. Three tutorials that I found helpful are at Iron Whisk, Joe Pastry, and Sarabeth’s recipe published on Leites Culinaria. Thanks! I still can’t believe I pulled this off! Thanks for all the croissant making tips and links to tutorials. 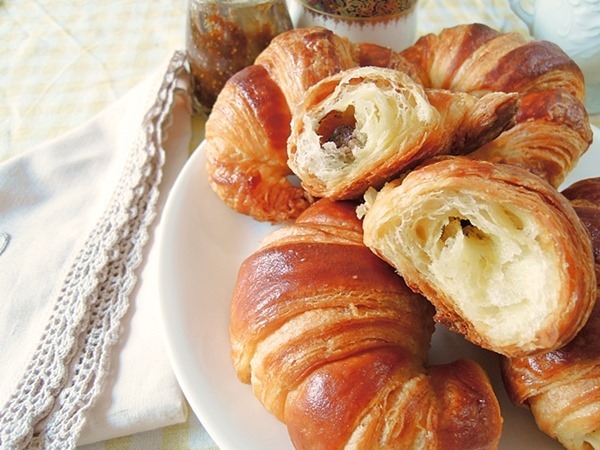 Your croissants turned out beautifully! OMG – Loving the colors and the layers! Thanks for the tutorial links. Did you make any changes/substitutions to the ingredients in the recipe? Mmmm. Yours look delicious! They turned out beautifully! Thank you, I’m still amazed! These look absolutely beautiful! Great tips too! 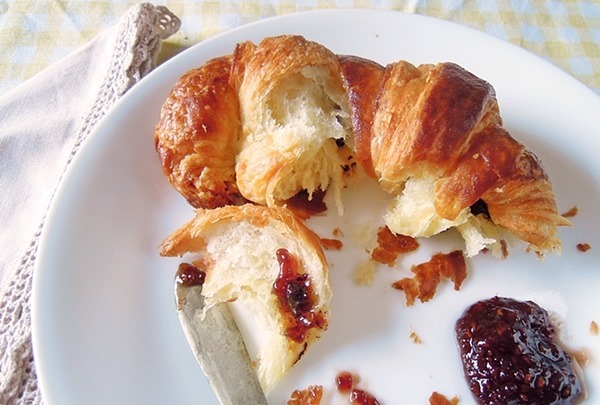 Thanks, still on a high – I made croissants! Those are some great looking croissants! Thanks for all the additional information. Will help me in my next go-around with this recipe. So true! Apparently we still have the danish to come. Bring it on, I say. Beautiful job. 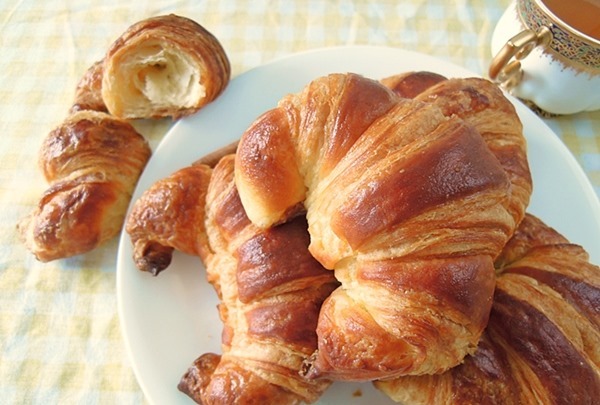 Love the golden color of your croissants. I know, weird word “laminate” right? That’s why I love this group! wow! beautiful job! I can’t imagine doing this in the hottest part of the summer. I think I woudl have just skipped it until the winter. I tried again today and mine are proofing on the counter and not in the oven as instructed. I think I have a success on my hands. Hope they turned out really well! Look how beautiful they turned out! And you did it twice!!! I see honeycombs there. Just saying. Absolutely gorgeous photos and I really appreciate all of the tips and links. What a fabulous post! Makes me want to try again ~ just tossed my dough in the garbage. Your croissants are bakery perfect – maybe even better. Thanks for your kind words! Hopefully the next project will turn out well. Sometimes I sit on a failed project for a few months, and when I try again, it works perfectly – I guess that’s the mystery of baking! These look perfectly formed– Please come and make me breakfast! Yes sir! Would you like fig jam with the chocolate croissant? 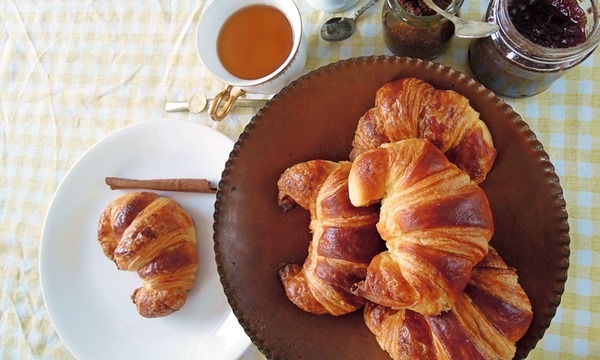 Your croissants look like small masterpieces – perfectly done and beautifully photographed. Respect. 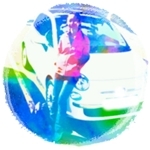 great learning experience…and I appreciate your post. Your croissants are beautiful. With all the problems yours look just perfect! Fun baking with you too! You have great tips! I’m planning to attempt my first croissants this weekend and, I’ll admit, I’m sweating bricks. I’ll be the one reading and re-reading your post for advice. Thanks! First time making laminated dough is *terrifying*! But look the dough in the eye and take your time, and it will work. I hope it went well?